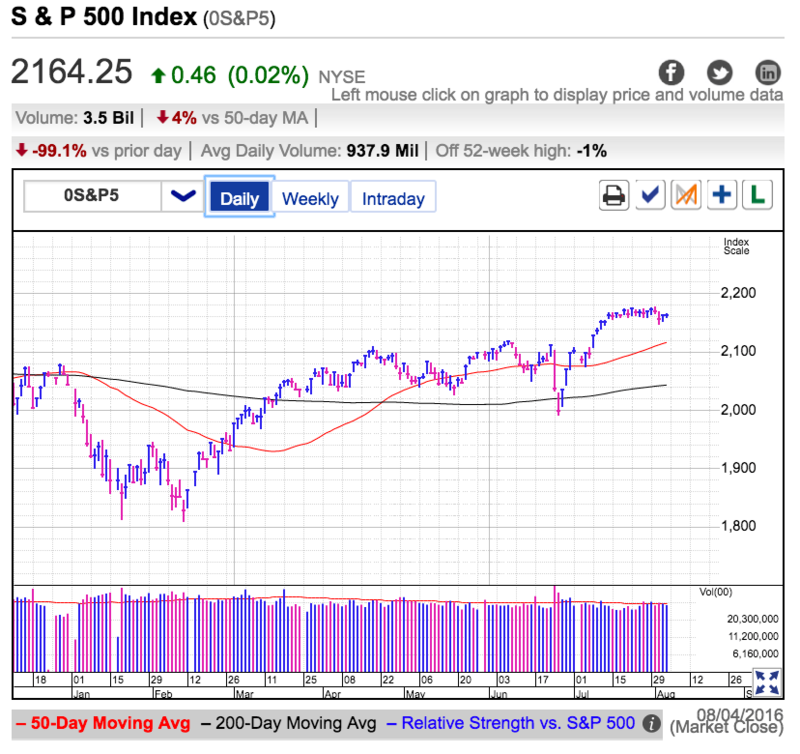 Category Archives for "Intraday Analysis"
The S&P500 extended its streak of listless summer trade Thursday as we remained stuck inside a tight trading range stretching back several weeks. Tuesday’s selloff was the biggest move in a while, but even that failed to motivate traders to trade. Barring a calamity, we shouldn’t expect volume to pick up until after institutional money managers return to work after Labor Day. In the meantime little guys will continue ruling the roost. Their erratic trade drives these wild intraday swings, but they have so little money that these gyrations peter out hours later. Up five-points, down-five points, repeat until thoroughly seasick. Friday morning we get the monthly employment report. Unless it is truly shocking, we shouldn’t expect much from it. The first six-months of the year we were stuck in a half-empty mood. But now that we’ve held near all-time highs for a month despite numerous bearish headlines, it seems we shifted to a half-full mindset. That means the market will likely cheer a strong employment report because it means the economy continues to improve. If July hiring is weaker than expected, that means interest rates will stay low for longer. No matter which way employment goes, owners will have the excuse they need to keep holding. When owners don’t sell, prices remain firm. The Brexit and all the other negative news we received this summer failed to rattle owners’ resolve and I don’t expect anything we hear Friday morning will change that. If prices fall in a knee-jerk reaction, that will be yet another buying opportunity. I apologize for the two-week delay since my last free blog post, but I’ve been busy working on the backend of my website. The most noteworthy item you will notice is I changed my domain from “crackedmarket.com” to “cracked.market”. Both addresses work identically and will take you to the same place, but I’m rebranding the website “cracked.market” because I like the way it looks. Now that I have several major behind the scenes items taken care of, I’m working on the layout and you will see those changes in coming weeks. I will probably post with a lower frequency for the remainder of the summer as long as the market continues trading sideways. If something dramatic happens, I’ll be sure to share my thoughts, but hopefully the remainder of the summer will be quiet and dull. For readers that want daily analysis, don’t forget about my Premium Subscription, which includes a two-week, risk-free trial. Japanese turmoil infected global markets Thursday after the Bank of Japan declined to enact additional stimulus to combat that country’s deflation. European markets tanked and the S&P 500 gapped half-a-percent lower at the open. But the panic was short-lived as we rebounded into the green by lunchtime. Japan hasn’t been on the market’s radar with most traders fixated on China and oil prices over the last six-month. Initially it seemed like that trend was continuing until a late selloff clipped 20-points from the S&P 500 in less than an hour, easily shoving us under the morning’s lows. Early relief quickly degraded into fear of owning stocks overnight and a stampede for the exits. Fear of this market is well founded since events in Japan will likely get worse before they get better. Very rarely are 3.6% selloffs an isolated incident and most likely there is more pain in store for Japanese markets. The question is if U.S. investors will continue ignoring Japan’s problems, or if Thursday’s price-action shined a light on the next big thing for traders to fret over. As I’ve been discussing on these pages for a few weeks now, we’ve come a long way from February’s lows and it is normal and natural for the market to cool off following such a hot run. This vulnerability means we need to be especially careful here. 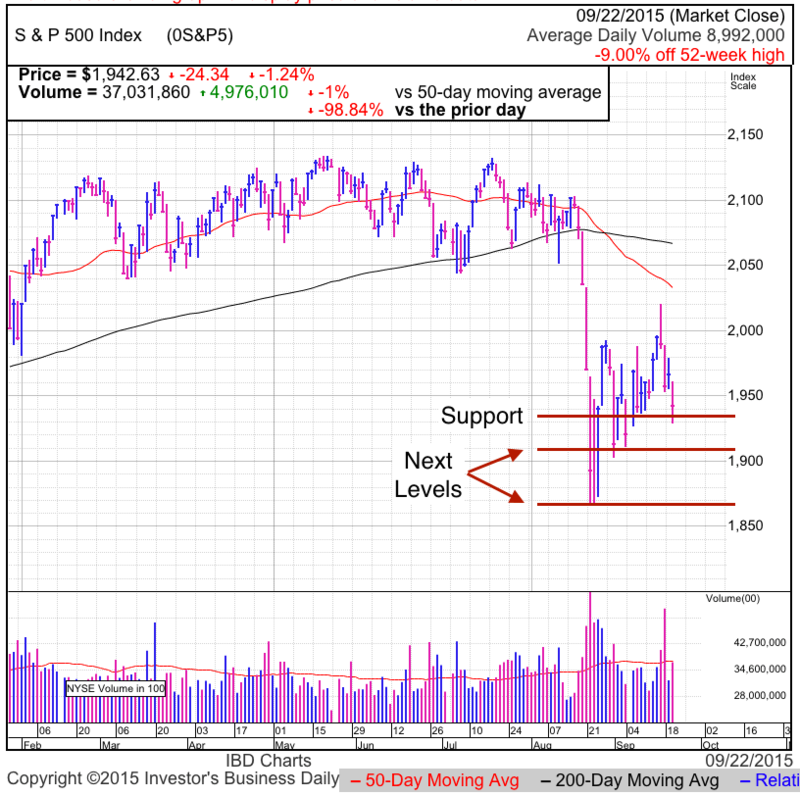 One false step could kick off a larger wave of selling that pushes us back to 2,000 support. I don’t expect Japan to be any more of a problem than Chinese slowing or plunging energy prices, meaning this shall pass too. But between now and then we could experience a fairly dramatic dip. While it will feel terrifying, this is just the market’s normal two-steps forward, one-step back. Just when everyone is predicting the end of the world, we will bounce and resume our march to all-time highs. The most nimble traders can move to cash or even short the market Friday if we continue trading weak. Most likely this won’t be a major selloff, but dipping another 70-points to support creates a great swing-trading opportunity. If prices stabilize and we finish strong Friday, then this is little more than indigestion and we should cover our shorts and position ourselves for a run to all-time highs above 2,130. For those with a longer-term horizon, ignore this noise. We will stumble and everyone will claim the sky is falling, but this is a great opportunity to buy your favorite stocks at a discount. On Tuesday the S&P500 rebounded decisively from Monday’s selloff and is again challenging 2,060 resistance. This was a welcome relief since five of the last seven-trading sessions ended near the bottom of the day’s trading range. While the popular market truism is “it’s not how you start, but how you finish”, Tuesday’s rebound went against this popular convention. While it would be easy to feel bearish about the recent price-action, when taken in context, it is highly noteworthy that these five-attempted breakdowns failed to build momentum. It’s like jumping on a frozen pond. Never a good idea, but the risk of falling through the ice drops dramatically after the first few jumps. If you haven’t fallen in by the fifth jump, then chances are pretty good the ice beneath your feet is solid and more than enough to hold your weight. The same can be said about the stock market holding up after probing 2,040 support the last several days. If we were going to crash, it would have happened by now. Even though I’ve been cautious the last couple of weeks because of how far we’ve come since the February lows, the market is proving incredibly resilient. This choppiness has chased off many of the weak owners and the remaining ownership base is stronger as a result. Since we haven’t fallen through the ice yet, that means the higher probability trade is sticking with the uptrend for the near-term. While the next move is most likely higher, it is still open for debate how we get there. 2,060 has been acting as clear resistance the last couple of weeks. We could simply break through this level Wednesday and not look back. The other possibility is Wednesday we retreat back into the 2,040/2,060 trading range and retest the lower end of the range. The ideal buy-point is falling under 2,040 support but rebounding when confident owners keep supply tight. The S&P500 slipped 1% Tuesday, ending a streak of five-consecutive up days. Volume was average, but less than the elevated levels seen during the breakout above the 50dma. Oil gave up a big chunk of its Monday gains and was an excuse for equity traders to take profits following this nearly 200-point rebound from February’s lows. It comes as no surprise the market’s gains slowed down after such a strong run. Big money managers hate chasing large jumps in price. Experience taught them these things inevitably cool off and they can get in at better prices if they are patient. In a bit of a self-fulfilling prophecy, big money’s reluctance to buy leads to a vacuum of demand and causes the very pull-back they are waiting for. Just like big money, we should also resist the temptation to chase. This is a far better place to be taking profits than adding new positions. If someone missed the move, chalk it up to a learning experience and wait patiently for the next trading opportunity. Better to miss the bus than get hit by it. Last Thursday I told readers to watch for a rally that breaks 2,000 and then fizzles. So far that’s been exactly what happened. Friday’s strong employment pushed us through 2,000 resistance, but not long after demand dried up and we slipped from those midday highs. When the market fails to rally on good news, look out below. And if we needed confirmation, we got it Monday when oil popped 5% yet the S&P500 finished the day flat. Only a few weeks ago a move in oil like that would have lit a fire under equities. The lack of movement Monday tells us bulls are tapped out. While one day of weakness doesn’t automatically make this the start of a bigger pullback, we will know real soon if it is. Selloffs develop quickly and if we are consolidating recent gains, expect a dip to at least the 50dma to develop over coming days. On the other hand, if prices firm up instead, expect the rebound to continue to at least the 200dma. If someone shorted a break of 2,000, the trade is working and you should continue holding until at least 1,950. But now that the weakness started, move your trailing stop down to 2,000 because if this is the real deal we shouldn’t retest that level. Tuesday the S&P500 continued its rebound from last Thursday’s lows and is now just shy of 1,900 resistance. Not a bad turn of events given how awful things looked last week. This strength came on the coattails of a bounce in oil prices due to a rumored OPEC meeting and prospective supply cuts. The meeting happened, but they only agreed to cap production levels, not cut supply as hoped. Failing to live up to expectations sent oil prices tumbling Tuesday, but amazingly enough, the S&P500 closed at the day’s highs despite oil’s reversal. This is highly noteworthy because it was one of the few days this year where oil finished at the lows but stocks managed to close at the highs. Are stocks finally breaking this unhealthy correlation to oil prices? One datapoint doesn’t create a trend, but it is certainly a good start. In last Thursday’s free blog post I caught flack from hecklers for suggesting that was the wrong time to sell defensively. Luckily for me hecklers are the most bold just before a reversal. While I am in no way suggesting we are out of the woods, a person who resisted the urge to bail out last week was rewarded with a nearly 100-point rebound from the lows. If a person wanted to sell defensively, today was a far better opportunity to do it than at any point last week. Everyone knows markets move in waves, unfortunately most forget that in the heat of the moment. While I wrote about a rebound to 1,900 last week, I sure didn’t expect it to happen over two-days. But that is the way the market works. Either it takes so long to make a move that it convinces us we are wrong before proving us right. Or it does it so quickly we barely have time to register what happened. Clearly this bounce off of Thursday’s lows falls into the latter camp. It is nice to talk about what happened, but what everyone wants to know is what comes next. For those that cannot handle this volatility, selling proactively near 1,900 makes a lot more sense than reactively selling near 1,800 and isn’t a bad decision for anyone needing a timeout from this chaos. A few weeks ago I wrote about us falling into an 1,800 to 1,940 trading range and I haven’t seen anything yet to suggest this has changed. Even though we might continue higher in the near-term, this rebound will likely fizzle and almost without a doubt there will be another opportunity to get in near 1,900 in the future. Sideways markets are the worst for longer-term owners because they hold the risk of a larger decline but are not getting paid for it with an appreciating stock price. This isn’t a problem for the resolute buy-and-hold owner, but those with less conviction are at a greater risk of reacting poorly to the choppiness inside a trading range. Those of us that have a little larger appetite for risk, Tuesday’s price action was encouraging. As I already mentioned, it was a significant development when oil finished at the day’s lows and equities at the highs. Historically oil prices and the broad equity market have a very weak correlation and at some point this unhealthy relationship will end. Could this be the start of that? While OPEC didn’t give us what many were hoping for, production caps are a good start. Much of the fear fueling this plunge in oil prices was producers ramping up volumes to offset their declining incomes. A break from this runaway ramp in supply is a good start. If oil stabilizes around $30, while not a healthy number, at least equities can price it in and move on. As I shared in a previous post, we have fallen far enough that we shouldn’t plan for a v-bottom and instead expect this sideways choppiness to persist through at least the end of the quarter. But for the nimble swing-trader this presents a trading opportunity. Buy weakness and sell strength until something new comes along. Choppiness in the S&P 500 continued Tuesday when we recovered most of Monday’s selloff, the day that erased most of Friday’s gains. Three-days of nearly equal and opposite moves, but the one constant through all of this has been the driver: oil. Equity traders cannot make a move until they first see what oil did overnight. Then, and only then, can they decide if they should buy or sell stocks. This trading mentality lead to a nearly perfect 98% correlation between oil and equities since the start of the year. This is the tightest link in more than 25-years, far eclipsing previous periods of elevated correlation that only approached 80%. Clearly this an abnormal link that cannot last, but as long as equity traders think the only thing that matters is the price of oil, that is the card we have to play. The most impressive thing about today’s 1.4% pop is it came on the heels of a Chinese stock market meltdown. Shanghai fell more than 6% Tuesday and their bear market rout is carving out new lows. Chinese weakness triggered our January meltdown, but it seems traders have moved on to obsessing over oil prices and are increasingly indifferent to Chinese stocks. But this divergence might be short-lived since China, oil, and S&P 500 futures are tanking in overnight trade. If this weakness persists, the fourth whipsaw will unwind the bulk of Tuesday’s gains. But as I warned in my last few blog posts, we should expect and be prepared for this type of volatility. Corrections larger than 10% rarely result in v-bottoms that rebounds to recent highs. Instead we see choppy trade as dip-buyers, regretful owners, and over-confident bears fight for control. One day we are saved, the next day the world is ending. And so the cycle continues until the market has battered, bruised, and humiliated bears, bulls, and everyone in between. In normal, trending markets buy-triggers and stop-losses work well, but these are clearly are not normal times. Trading predetermined levels is the quickest way to give away money in choppy basing patterns like this. If you set a stop-loss 20-points under the market, you pretty much guaranteed yourself a 20-point loss. That doesn’t make a lot of sense, so how do you trade this market? The simple answer is you don’t. 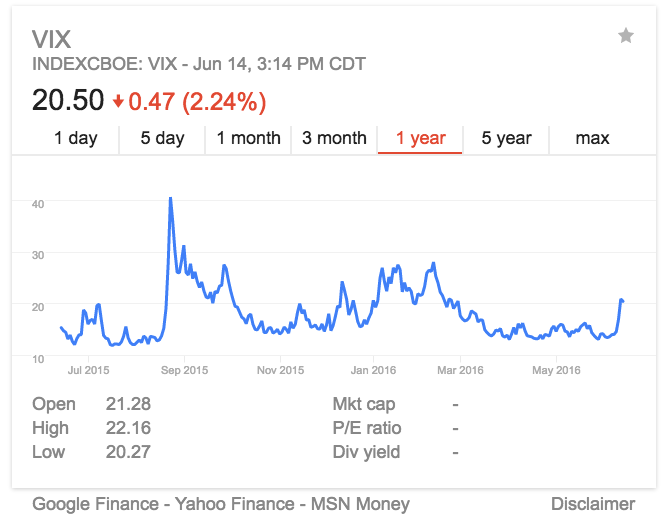 The safest approach is to wait for normalcy to return where traditional risk management techniques protect you instead of guarantee losses. The other approach requires an iron stomach as you buy the dip, watch the market move against you, and rather than get scared out, buy even more. Every dip in the history has bounced and this one will be no different. Buy when other people are fearful is easy to say, but far harder to do. That being said, the market is most likely forming a trading range between 1,940 and 1,820. Baring brief excursions we should expect to trade inside this range through the remainder of the quarter. Earnings were the one thing that could have saved us, but so far it hasn’t worked out that way. On the other side, runaway selloffs happen over days, not weeks. It’s been a week since we bounced off 1,810 and at this point the panicked rush for the exits abated. While we will almost certainly retest those lows, the second time we approach a level is less scary than the first. The initial dip triggered a surge of automatic stop-losses and flushed out the weak, but all of that selling already behind us and second retracement will have a harder time building critical mass. For the ambitious, trading against this range is a third possibility. But since we are near the middle of this range, the prudent move is to wait until we approach one extreme or the other before trading against it. Free blog posts Tuesday and Thursday evenings. Weekend video recaps coming soon! If you want more check, out my premium subscription that delivers this analysis every day during market hours. It’s been a dramatic couple of days. Wednesday the S&P500 cratered over 3.5% in midday trade. But just when things looked their worst, we bottomed and recovered a majority of those losses with a powerful, 50-point rebound into the close. Volume was staggering and the second highest level in several years. The only day when more shares traded hands was August’s 5% bloodbath, a day also noteworthy for forming the bottom of the Fall selloff. Thursday morning we slipped into the red but the situation changed decisively when the ECB hinted more stimulus is on its way in March. Then a less bad than feared U.S. oil inventory report sent crude spiking 5%. Between the apparent capitulation volume on Wednesday, more easy money from Europe, and rebound in oil, have we put in a bottom? While Wednesday’s massive selloff did a lot of damage, it also purged most of the weak supply between here and 1,810. If anyone had a stop-loss, it was triggered when we plunged well beyond August’s lows. If an owner could have been spooked out, they were spooked out. But for every person who went running for cover, their was a bold buyer willing to take advantage of these emotional discounts. Removing weak owners and replacing them with confident dip-buyers is a very constructive development. Since we cleared most of the stop-losses under 1,850, it will be far harder for another dip under this level to trigger a runaway selloff. But before we get too excited and start buying with reckless abandon, this correction fell well past the point where a V-rebound to previous highs can save us. This 10% selloff pushed us back into correction territory for the second-time in six-months and nerves are frayed. That means we should expect this erratic trade to continue as we carve out a base. Similar whipsaws occurred during the September bottoming and we should plan for the same choppiness here. In the near-term that means selling strength and buying weakness as we settle into a multi-month trading range. Be prepared for a retest of Wednesday’s lows at some point and expect regretful owners to flood the market with supply everytime we try to rally above 1,900. While it is tempting to trade our bullish or bearish bias every time the market feigns a breakout or breakdown, the best money over the next couple of months will come from trading against these moves. 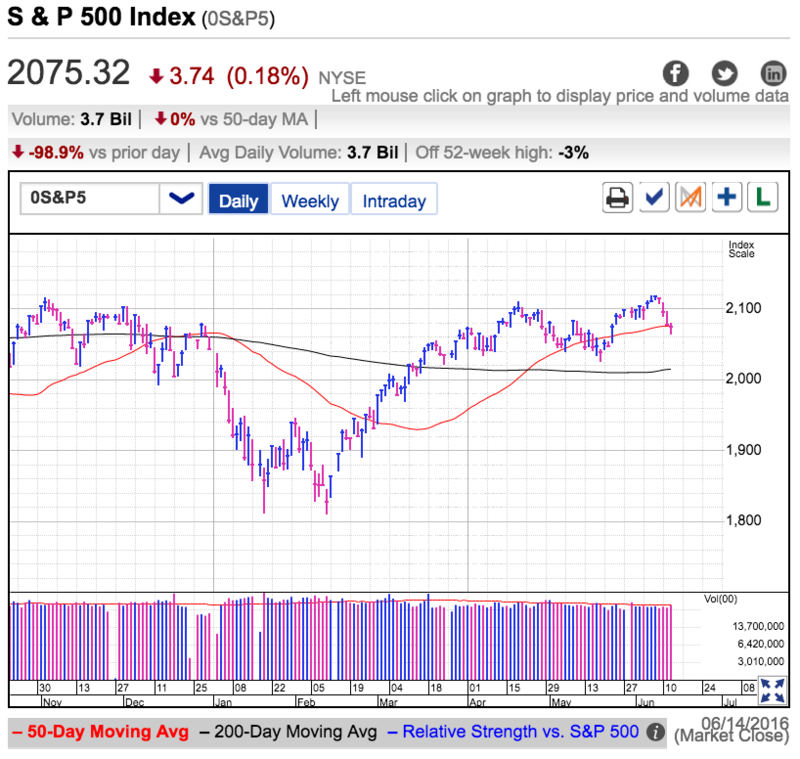 The S&P500 sliced through the 200dma as it slumped 1.4% Wednesday. This move leaves us just above 2,040 support that comes from earlier in the year. Volume was barely average, telling us there wasn’t a lot of reactive and emotional selling today. Nothing like a little selloff to revive bears’ hopes and dreams. Whether you were watching TV or reading online streams, plenty of people believe this is the “BIG ONE”. But here is the thing, dig back in your memory and recall a time when all the pundits successfully predicted a big selloff before it happened. If you are struggling, don’t worry, it’s not your memory that’s failing you, it’s the pundits. Now don’t get me wrong, most of these people are exceptionally intelligent and insightful. There is also a lot of truth to what their ideas. But what trips them up is the basic laws of supply and demand. When the crowd is convinced we are headed lower, how do you think they are positioned? Once a pessimist sells, they lose their vote and are merely cheerleaders. And right now it feels like we have a lot of people rooting for the market to go lower. The reason people are so quick to jump on the “this is it” bandwagon is because memories of September’s fear and regret are so fresh in their mind. The biggest headline these days is December’s looming rate hike. In a WSJ survey, 92% of economists predicted the Fed will boost interest rates next month. For all practical purposes it appears like there is universal belief the Fed will finally act. Monetary tightening for the first time in nearly a decade has people predicting doom and gloom for our economy. Of course many of these same people also called for runaway inflation and $10k gold because of the Fed’s “reckless” money printing. If they got the first call wrong, there is little reason to believe they will get it right this time. Further, the conversation shifted to rate hikes as soon as Quantitative Easing wrapped up last Fall. If anything, Janet Yellen has been dragging this out, so it should not be a surprise or shock to the systems when it finally happens. People don’t get hit by the bus they see coming, so this rate hike will be a non-issue. While people are scared by this selloff, this is just another buyable dip on our way higher. In my November 5th post, I warned people that we should be preparing for a very typical pullback following a large rebound. Sixty points later, that is exactly where we find ourselves. Two-steps forward, one-step back. Technicians frequently find Fibonacci patterns in directional moves. This would be a retracement of 24%, 38%, 50%, or 62%. Following a 225-point rebound, these are pullbacks of 55, 85, 112, or 140-points. We’ve already passed the 55-point mark and 85 isn’t very far away. While we don’t want to catch a falling knife, an interesting entry would follow the market slicing through support and recovering those losses on huge volume. This would be the capitulation day that chased of the last of the sellers. Traders who miss a big run always hope for a pullback that will let them get in, but all too often they lose their nerve when the market gives them what they were asking for. Embrace discounts, don’t fear them. 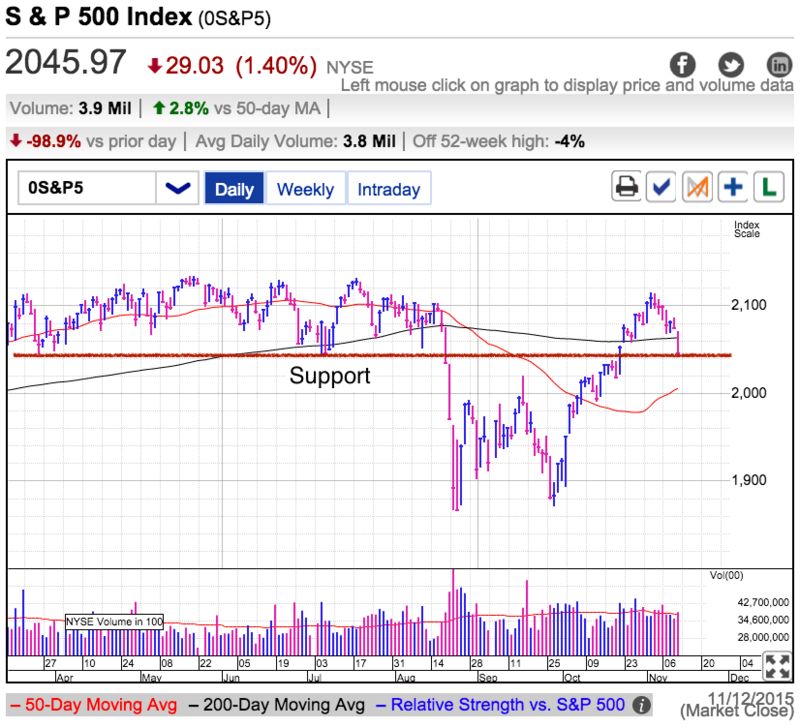 Stocks continued the “no hike” selloff as the S&P500 lost another 1.25% and closed fractionally above 1,940 support. Volume was restrained, not even reaching average levels. Investors were hoping the Fed would keep rates near zero and in order to avoid further spooking fragile markets, the Fed acquiesced when they decided not to hike last week. But rather than cheer, waves of traders have been selling the news ever since. We are still well within the heart of the 1,900 to 2,000 trading range, so stock owners are not panicked yet, but you can feel the uneasiness growing with each leg lower. There was no real headline driver for Tuesday’s global selloff, but overseas markets were hit hard and that selling spilled over to U.S. shores. And as I write this, it looks like we will have more of the same Wednesday because Asian and S&P500 futures are sharply lower. While we are still well within the trading range, it won’t take much to push us down to recent lows where the uneasiness will give way to fear and panic. When the herd is panicked and we see our screens filled with red, it is hard avoid being infected with the same feelings of dread and despair. But a further selloff is actually the most bullish thing that can happen. The two most common reversals are the v-bottom and the double-bottom. V-bottoms are sharp and fast. We’re nearly a month into this correction, well past the window of opportunity for a v-bottom to save us, so we can eliminate that as a trade setup. The next best savior is the double-bottom. For those that are not familiar, a key attribute of the double-bottom is having the second dip undercut the first dip’s lows. That means the most bullish thing that could happen to us involves us falling under 1,860. This is something we should be bracing ourselves for, but rather than fear this capitulation bottom, we should welcome it and even trade it to our advantage. Of course we might not go straight to 1,850, or even get there at all. The next likely level to bounce off of is the 1,900-1,910 region. We could easily see an intermediate support at these levels. Where we go from there largely depends on how traders respond. If we see full panic and volume is off the chart, that could be our capitulation bottom. But if the bounce is feeble and fails to recover 1,950, the new lows under 1,850 are likely. While it will be uncomfortable, if we know what is coming, then we will be better prepared to trade it well. What’s a good trade worth to you? How about avoiding a loss? For less than the cost of a daily coffee, have analysis like this delivered to your inbox every day during market hours while there is still time to trade it. Start your free trial today!